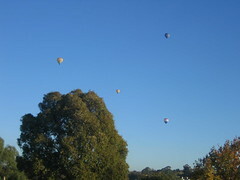 Despite this year's summer having done its damnedest to do autumn out of a job, there is one sure-fire sign in Melbourne that the misty season is a-cumin in for real, and that is when you start seeing hot air balloons suspended, like christmas baubles, over the Yarra on still mornings. Little Missy loves balloons (as you do at her age). The trouble is that she likes her bed even more so in the early morning (which is quite unlike her attitude in the late evening, I might add!). Oh well! The hour's coming off in a week or so. Maybe they'll get together then. Meantime, we have an old crepe myrtle which has actually managed to flower this year (in previous years, its buds have been about a month behind the rest of the local myrtle population, and have dropped off when the weather got colder). A bit of rain works wonders!